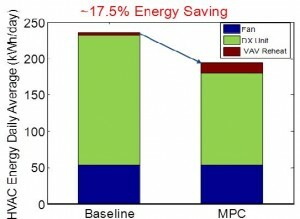 Through simulation based analysis and demonstration at customer sites CBEI quantified the potential for energy savings of overlay solutions for intelligent building operations such as advanced supervisory controls and diagnostics at 10-30% beyond the benefits of current building automation systems (BAS). These advanced solutions are not widely adopted due to remaining challenges with scalability. Too often they require prohibitive on-site labor, building specific model and algorithm development, additional sensing, and advanced skill-sets. Demonstrating the plug-and-play application of advanced controls and other building operations applications. Defining a hierarchical optimization-based control approach with online estimation models that allows for adaptive scalable deployment. Demonstrating sustained energy benefits of forecast-based advanced control algorithms beyond current building automation systems (BAS). The demonstration of advanced controls as a supervisory overlay on existing building automation systems has reaffirmed the energy-benefit potential, showing the ability to reduce the HVAC energy consumption by 10-30%. Current formulations are not scalable as they require custom model development, functional tests, model calibration, and skilled (graduate level) implementers. To impact the existing buildings market the commissioning of advanced controls must be highly automated. The focus on commissioning cost and complexity of advanced solutions should be commensurate with the focus on energy savings. Healthy building equipment is a pre-requisite for optimal operation, thus equipment diagnostics is an important complement to advanced controls. Equipment health enables maximization of operating performance and maintenance of required indoor air quality.